GOLD PRICES held firm in all major currencies Thursday morning in London, supporting gold ETF trust-fund share prices as world stock markets sank on fresh worries over the inverted US yield curve and worsening US-China tensions. European equities extended a sharp drop in Asian stocks – taking Germany’s Dax index 15% lower for 2019 to date – following the arrest in Canada for extradition to the United States of Meng Wanzhou, chief financial officer of tech giant Huawei Technologies Co, apparently over potential violations of US sanctions against Iran. Oil prices snapped lower after Saudi Arabia’s energy minister said this week’s meeting of the Opec cartel and Russia won’t meet analyst expectations for a 1 million barrels per day cut to their combined 2019 output plans. Platinum prices fell to $790 per ounce, nearly a 3-month low. Silver prices also fell to show a 16% loss for the year-to-date, dropping to $14.36 per ounce. Gold prices today held at $1236 per ounce, while the US Dollar rose near this week’s highest level against other currencies. “Gold ETF holdings have become much more resilient in 2018,” said Suki Cooper of Standard Chartered at the gold market’s biennial LBMA seminar in London on Wednesday, noting how this summer’s drop in the gold price failed to spur heavy selling by investors, despite some 200 tonnes-worth of positions added since the start of 2017 then showing a loss. 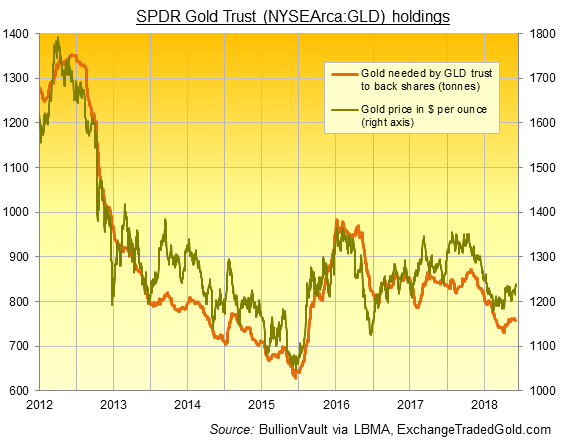 The largest gold-backed ETF vehicle, the New York-listed SPDR Gold Trust (NYSEArca: GLD), has not changed in size so far this week after shrinking by 3.5 tonnes as investors sold on Monday. “A balance between a host of factors such as [a widely expected] rate hike by the US Federal Reserve in December, uncertainty about trade tensions between Washington and Beijing, and a flattening yield curve has helped create a premium for the bullion,” says Benjamin Lu, a commodities analyst with Phillip Futures in Singapore. 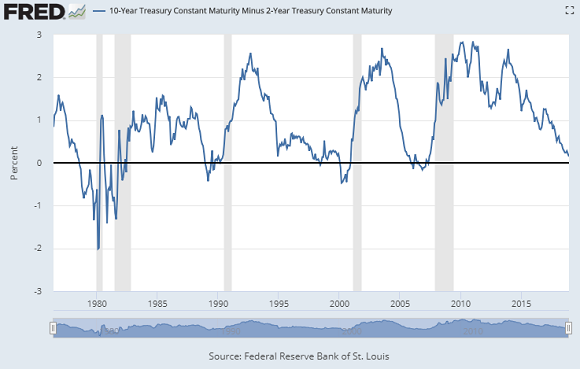 “The yield curve has sent a chill down investors’ spines in regard to the future outlook of the US economy,” agrees Chad Morganlander, senior portfolio manager at Washington Crossing Advisors in New Jersey, also pointing to how the yield offered to investors by shorter-term US Treasury bonds is now near or above longer-term yields. Inverting the more typical yield curve, where investors expect higher annual returns from longer-term bonds, this pattern has preceded each of the last five US recessions. The spread between two-year and five-year Treasury yields inverted this week and the two-year and 10-year spread has shrunk to its flattest in more than a decade thanks to a sharp fall in long-term rates. Palladium meantime retreated from its new record high of $1263 per ounce but remained more valuable than gold for the first time since 2002. Here in London on Thursday, the UK Parliament continued to debate Prime Minister Theresa May’s proposed Brexit deal for leaving the European Union next March. Having suggested this week that the UK could cancel Brexit without needing approval from the other 27 member states, the European Court of Justice will confirm its decision on the revocability of Article 50 on 10 December – 24 hours before the UK Parliament’s key vote on May’s deal. Sterling gold prices held just below £970 per ounce Thursday, while gold priced in the Euro edged down from €1090.